In a medium mixing bowl, whisk together 2 tablespoons freshly squeezed lime juice, 3 tablespoons olive oil, Dijon mustard, agave syrup, 1/4 teaspoon salt and 1/4 teaspoon pepper. Incorporate the onion, mix, and let it sit so it will pickle or macerate while the rest of the ingredients are prepared. In another medium mixing bowl, combine the adobo sauce from chipotle chiles in adobo, 2 tablespoons freshly squeezed lime juice, 2 tablespoons olive oil, cumin, garlic, 1/4 teaspoon salt and 1/4 teaspoon pepper until well mixed. Taste for salt and add more if need be. Brush a baking dish with olive oil, place the salmon on it, and pour the chipotle sauce over it, spreading it throughout. Bake anywhere from 12 to 15 minutes, depending on thickness of the fish, until the salmon is cooked through, yet still very moist. Remove from the oven. On a large skillet or grill pan set over medium heat, cook the bacon for 3 to 4 minutes per side, until crisp and browned. Transfer to a plate lined with a paper towel. When ready to make the sandwiches, mix the vinaigrette with the red onion and incorporate the baby greens, toss well. Toast the bread. 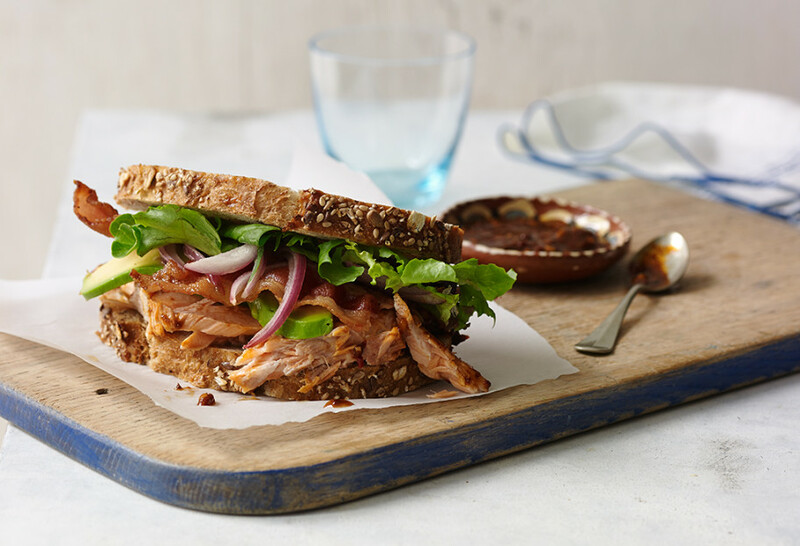 On each bottom slice, place a cooked salmon filet, top with a couple bacon slices broken in half, a serving of a baby greens, 2 to 3 avocado slices, and the top bread layer to finish making the sandwich. I would like if Peti, would add a shopping list. I love cooking your recipes! It would be easier if you had a recipe shopping list. Thanks for the suggestion Elsa. I hope you continue to enjoy the recipes. Made this for dinner last night. I pureed the entire can of chipoltes in adobo to give the sauce a bit more ‘kick’. Did not use the bread, instead just plated the salmon, bacon and avocado over a large serving of the dressed greens. DELICIOUS !!!! Truly a high end restaurant quality meal. Thanks Pati–will definitely be making this often. Yay!!!! I am so happy you liked it! Ohhhh,my!!! I’ve just finished eating this for dinner and it is the BEST meal I’ve had in a very long time. It’s the first of your recipes that I’ve tried and I’ll certainly cook more of them. Thank you so very much. I’m thrilled you love it, Catherine! WHAT was the name out that bowl with the meat and vegetables in it?. I have to have that meal! Thank Pati for the receipes I wacht all the serie 4 my mouth waterer. Pls can you give me a receipe for sweet tamales. Your awesome I love your recipes …this recipe turned out great…Just wanted to point out the recipe shown above doesn’t include Avocado. Ooppp 🙂 . Thanks again!